„Be Smarter. Save Water“ is an initiative by Henkel Beauty Care with the goal to increase awareness of the importance of a responsible use of fresh water. The initiative’s website points out how much fresh water exists on our planet and how much of this water is used by humans everyday. Furthermore, it gives it’s visitors some really helpful tipps to check and, if necessary, reduce their own waste of water. And it does it in a very cool & smart way! 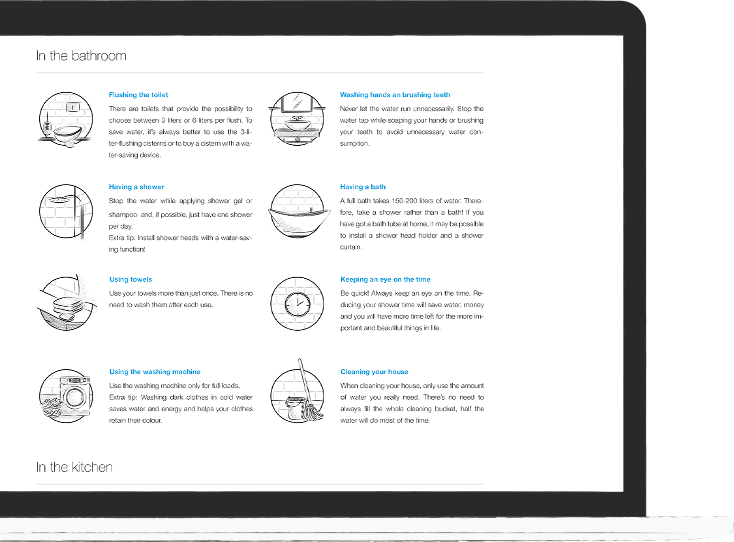 The home screen includes an „interactive bathroom“ which is completely hand drawn. 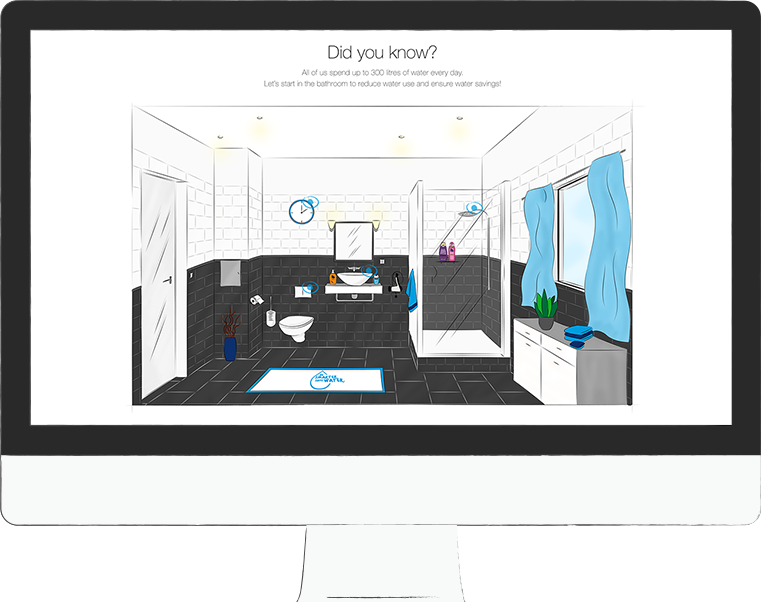 When hovering some elements inside the visual, the user gets tips for saving water during it’s daily routine in the bathroom. On the website’s tips page users get a powerful package of useful tips for saving water during their whole daily routine – from the bathroom to the garden. All tips come with a small icon to loosen up the matter of text. Unexpected and therefore brilliant – the facts page is definitely one eye-catcher of the website. Many small icons and images combined with significant short text lines tell the user how much fresh water exists on our planet, where and how all this water is used and what problems will occur over the next decades, if we continue wasting water as we do. Did you ever spend some thoughts on your daily carbon footprint? 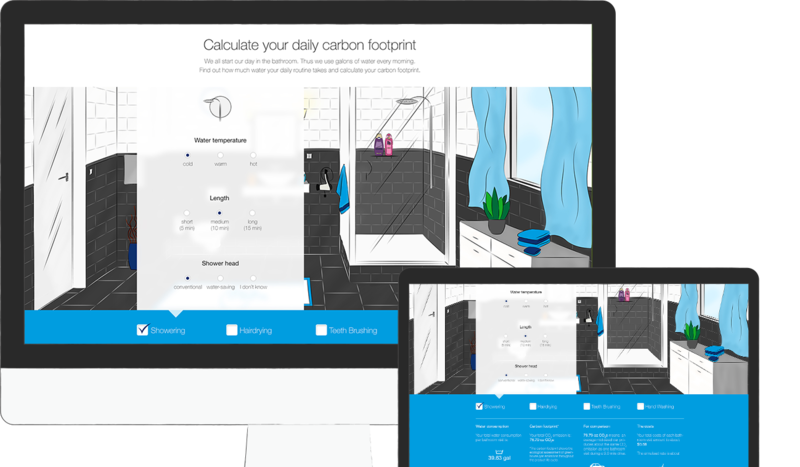 The website’s resource calculator tells you how much carbon you produce in the bathroom every day. You just need to fill in your data to get a visualization of your daily carbon footprint. Although, I’ve made the designs for many websites during my past career, this is definitely my favorite one (until now). The cooperation with the customer was extremely pleasant. They gave me a relatively free rein in creating the content and structure of the website and they liked the concept of the design instantly. Moreover, I love the many small icons and images of the design, which are all hand drawn by myself. Especially the facts page is one of my big favorites. 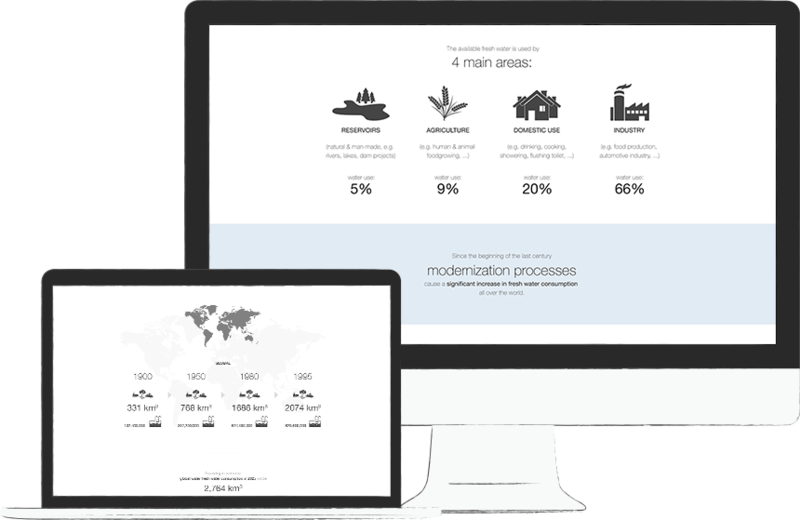 There was a flood of important information on the global water situation to be transferred to the website’s visitors. But as nobody likes reading long copies, especially if they’re dry facts about an unpleasant topic, I was looking for an opportunity to transfer all those information in a way that makes fun and is pleasant to behold. It definitely was a really big challenge and took me a lot of time to read, understand and then draw the facts in an understandable way. But I love the result and I enjoyed making the design a lot. Please note: the logo for the initiative and the included font haven’t been part of my work on this project but have been created and developed by another agency.